The sequential approach to colour texture classification relies on colour histogram clustering before extracting texture features from indexed images. The basic idea of such methods is to replace the colour triplet (RGB, HSV, Lab, etc.) associated to a pixel, by a scalar value, which represents an index of a colour palette. In this paper we studied different implementations of such approach. An experimental campaign was carried out over a database of 100 textures. The results show that the choice of a particular colour representation can improve classification performance with respect to grayscale conversion. We also found strong interaction effects between colour representation and feature space. In order to improve accuracy and robustness of classification, we have tested three well known expert fusion schemes: weighted vote, and a posteriori probability fusion (sum and product rules). 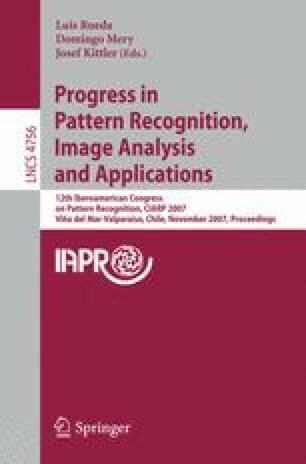 The results demonstrate that combining different sequential approaches through classifier fusion is an effective strategy for colour texture classification.